The client is Australia's No.1 men's swimwear and underwear manufacturer. Established in 2001, the client is a multi-million-dollar global enterprise, manufacturing over one million products annually in west Sydney. With over AUD $20 million in annual sales, and Australian sales constituting only 10 percent of its business, the company relies entirely on online sales. The client retails in some of the biggest department stores in the world such as Selfridges, Harrods and House of Fraser in the UK, Printemps in Paris, and Harvey Nichols in Dubai, as well as in small boutiques in various cosmopolitan cities. The clients' online store ships to more than 150 countries globally and offers free delivery. The brand has a large online following and is the 7th most popular search term in Australia. Brand endorsements include celebrities like Ewan McGregor, Billy Connolly, Daniel Radcliffe and David Beckham. The main challenge involved maintaining the stitch lines and product shapes correctly. The client required an outsourcing partner to create 3D models of each of its products to aid its ecommerce sales. On receiving the clients' business enquiry, O2I suggested a free quality test (trial). During the trial, the client transferred three .fbx files and three product samples in JPEG formats via Dropbox. During the trial, O2I designated three resources to complete the project. One 3D model was completed successfully (inner and outer texture and stitch lines) using the input sample JPEG as references. O2I's process involved UV Mapping, and creating real time textures with different colors using 3DS Max and Adobe Photoshop software. Next, we saved the output in a PSD format and uploaded via Dropbox. On receiving the textured input, the client loaded the texture with the 3D model. Finally, O2I tested the 3D model and its interaction. The trial was successfully completed within two business days. Based on the success of the trial, the client signed a full-time ongoing contract with O2I to outsource 3000 images. 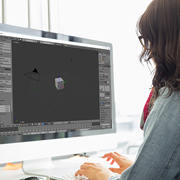 O2I designated three full-time resources to complete three 3D models daily. The client was highly satisfied with our services. They received a 70 percent cost savings and a quick turnaround. The client acknowledged that our 3D models perfectly met with their expectations. At O2I, we use skilled design teams and deliver high-quality output. With two decades of experience in the outsourcing field, in-depth domain knowledge, skilled professionals, ISO certified processes and a free trial, we far surpass our competitors. We ensure a hassle-free outsourcing process enabling our clients to focus on core business activities. When you outsource to us, you save up-to 60 percent in costs and increase revenue and productivity. Our outsourcing solutions include Finance and Accounting, Photo Editing, Data Management, Creative Services etc. Contact us, tell us your design requirement and get a free quote within one business day.